Should College Baseball Allow ‘Exempt’ Fall Games? The sun was shining, a light breeze was blowing and there were thousands of fans milling around taking-in a college baseball game. It wasn’t Baton Rouge on a Friday night in the spring. It was South Bend, Ind. this past Saturday. For the second straight year the Notre Dame and Michigan State baseball teams got together for a fall exhibition game on the same day their schools went head to head on the football field. They played in East Lansing, Mich. last year and they hooked-up in South Bend this year. The two schools are not alone in connecting during the fall. It’s a trend that has been growing in recent years since the NCAA mandated the late February uniform start date to the college regular season spring schedule. 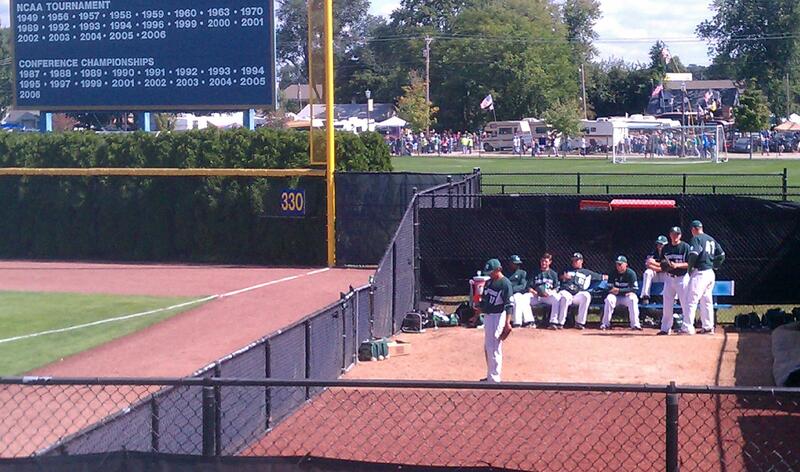 Michigan St. pitchers in the bullpen at Saturday's fall exhibition game prior to the Notre Dame - Michigan State football game. Texas, Rice, Vanderbilt, and Cal State Fullerton are among the higher profile programs that have scheduled fall games. They do it in part to evaluate their players (especially the younger ones) in live competition, but some also do it because those fall games count against their 56-game limit in the spring- meaning the two or three games they play in the fall are two or three fewer games they have to schedule in the spring. The time is right for the NCAA to take the fall games a step farther. It’s time to make three or four of these games “exempt” each year so that they do not count against the 56-game limit. It’s just good for college baseball. The fall games are a good thing, and Notre Dame and Michigan State have it figured out. Play them the day of a big football game when a lot of people are around.The Eck Stadium grandstand and surrounding area of the stadium had around 1,000 fans at any given time watching the game, with fans moving in and out taking-in parts of the game throughout the 10-inning exhibition. The fact of the matter is, most southern and warm weather schools don’t have to worry about lopping-off three or four games from their regular season, because they know their RPI is typically going to be strong enough when it comes to at-large bids at NCAA selection time. That is not the case for northern schools, who need every game they can get for the chance to get as close to 40 wins as they can to merit NCAA selection. Michigan State (36-21) found that out first hand in 2011 when they shared the Big Ten regular season championship, but missed an NCAA bid when Illinois won the conference tournament. However, making a handful of fall games is not just about getting a few schools a few more games to try to pad or add to its NCAA resume. It’s also about fairness and allowing coaches from northern schools to better evaluate their players, especially incoming freshmen, in an outdoor setting. Those same things are much tougher for a Michigan State, St. John’s, Notre Dame, Illinois, Penn State, or any other northern school to evaluate in January and February when they are trying to do it indoors. About half of the roughly 300 schools that play college baseball are located in northern climates, which means that those schools are preparing for a late February start to the regular season inside gyms, makeshift bubbles and indoor batting cages in January and early February. Meanwhile, their sun belt counterparts are out in the grass and the dirt every day in preparation for the start of a new season. There’s a reason Major League Baseball teams go to Florida and Arizona at that same time of year for Spring Training and there’s no reason college baseball coaches shouldn’t be allowed to take advantage of better weather in the fall to better evaluate their teams without it counting against their spring schedules. The NCAA lets college basketball play a pair of exhibition games every year, so what’s the harm in allowing college baseball teams to do the same thing? The fall exhibition format also allows for a more flexible format that allows coaches to insert and remove players at will without worrying about strict substitution rules that come with regular season games. Notre Dame and Michigan State each sent 10 pitchers to the mound in Saturday’s 10-inning game (the agreed upon format was 14 innings or three hours, whichever came first). They also each used nearly every one of their position players. 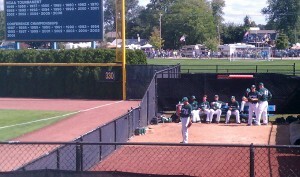 The Irish have 13 freshmen on their 2011-2012 roster, while the Spartans have eight. The at-bats, innings pitched and time in the field were crucial to both coaches for outdoor evaluation that they won’t get in the middle of winter on the eve of the regular season. Obviously, not every school has the advantage of scheduling a fall game around a big college football game, but there are other options. DI basketball schools play their games against lower division competition and DI baseball schools could do the same. There are plenty of similar smaller programs around the country- in Florida, Texas, California and other warm weather states-that could benefit from similar opportunities. They wouldn’t get that same experience in the spring, because there’s no benefit for Florida or Texas to play those schools when it counts. Why not let Webber International or Trinity have a chance to mix it up with the big boys too. They typically only get the chance if they’re a late add to someone’s schedule due to a rain out. Good for college baseball and everyone who loves it and plays it.